There has never been a frontrunner for a major party nomination like Donald Trump. Since announcing his candidacy, Trump has seemingly broken every rule of political campaigning — at times disparaging women, racial minorities, people with disabilities, and leaders of his own party — yet he has led the national polls for nine straight months, won 15 of the first 24 caucuses and primaries holding a presidential preference vote, and accumulated far more delegates than any other candidate. Trump could lock up the Republican nomination for all practical purposes as early as March 15 if he finishes first in winner-take-all primaries in Florida and Ohio. Trump has achieved his frontrunner status by appealing to a large group of Republican voters who are fed up with their party’s established leadership. He has also been greatly aided by the inability of mainstream conservatives to unite behind a single candidate. Instead, the anti-Trump vote has been split among several other candidates. This has allowed Trump to win primaries with a minority, and often less than 40%, of the total vote. Trump is not only the most unusual frontrunner in recent history, he may also be the most divisive. In order to analyze the sources of support for Trump and his potential impact on the Republican Party, we conducted a national survey of 1,000 registered Republican and independent voters. The survey was carried out online by YouGov with half of the interviews conducted during the week before the Iowa caucuses and half during the week after the caucuses. However, there was almost no difference between the pre-Iowa and post-Iowa results. The findings presented in this article are based on a sub-sample of 623 registered Republicans who indicated that they were certain to vote in their state’s Republican caucus or primary. Among our sample of likely Republican primary voters, 40% indicated that Trump was their first choice for the GOP nomination. Ted Cruz finished a distant second with 19% support, and Marco Rubio finished third with 14% support. These results were similar to those of other national polls of Republican voters conducted around the time of the Iowa caucuses and to results of national polls conducted more recently. In addition to asking respondents about their top choice for the Republican presidential nomination, we asked them to rank 11 potential GOP candidates. The overwhelming majority of our respondents were able to rank all 11 candidates. 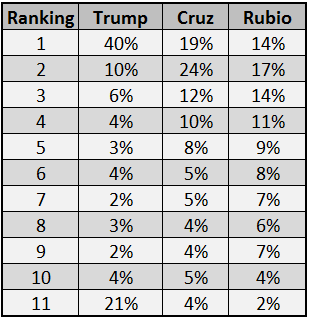 Table 1 presents the results of this ranking for the three leading candidates: Trump, Cruz and Rubio. It is striking that Trump was not only ranked first by far more respondents than any other candidate, he was also ranked 11th and last by far more respondents than any other candidate. More than one-fifth of all likely Republican primary voters and more than one-third of those supporting other candidates ranked Trump dead last. One other indicator of Trump’s divisiveness as a candidate is that a large proportion of Republican voters indicated that if Trump is the Republican nominee they would defect to an independent mainstream conservative candidate in the general election. Given a choice of voting for Donald Trump as the Republican nominee, Mitt Romney as an independent, or Hillary Clinton as the Democratic nominee, only 64% of Republican voters chose Trump while 30% chose Romney and 6% chose Clinton. Among those not supporting Trump for the Republican nomination, Romney actually led Trump by 46% to 45% with 9% choosing Clinton. Trump clearly inspires both strong support and strong opposition among Republican voters. But what are the major factors that explain these responses to Trump’s candidacy? In order to answer this question, we examined the relationship between Trump support and a variety of factors that have been identified as possibly explaining reactions to Trump’s candidacy: authoritarianism, nativism, and economic liberalism. The results displayed in Table 2 show that there were strong relationships between all three of these predictors and where respondents ranked Trump among 11 possible Republican candidates. We measured authoritarianism by asking respondents to agree or disagree with the statement that “what this country needs is a strong leader to shake things up in Washington.” Fifty-nine percent of Republican voters strongly agreed with this statement and among that group, 50% ranked Trump first and only 14% ranked him last. In contrast, among the 17% of Republican voters who were classified as low on authoritarianism by either agreeing only slightly or disagreeing with this statement, only 20% ranked Trump first and 48% ranked him last. Nativism was measured by three questions asking respondents to agree or disagree with a temporary ban on Muslims entering the United States, a proposal to build a wall along the Mexican border, and a proposal to deport all illegal immigrants currently living in the United States. All three proposals elicited strong support from Republican voters. In fact, there was a higher degree of consensus on these issues than on any of the economic or cultural issues in our survey. Fifty-one percent of Republican voters strongly favored building a wall along the Mexican border, 57% strongly favored deporting illegal immigrants, and 37% strongly favored a temporary ban on Muslims entering the U.S. Fully 28% of Republican voters strongly favored all three of these proposals. The results in Table 2 show that nativist attitudes were very strongly related to where respondents ranked Donald Trump. Among those scoring low on nativism, only 16% ranked Trump first while 47% ranked him last. In contrast, among those scoring high on nativism, 60% ranked Trump first and only 6% ranked him last. Nativist attitudes were, in fact, the single strongest predictor of support for Trump. In addition to authoritarianism and nativism, economic attitudes also predicted support for Trump. In contrast to most other Republican presidential candidates and, indeed, most other prominent Republican officeholders, Trump has sometimes veered from conservative orthodoxy on economic issues. For example, he has publicly opposed cuts in Social Security and Medicare or plans to privatize either of these entitlement programs. He has, at times, suggested that wealthy Americans should pay higher taxes, although the official tax plan released by his campaign actually called for significant cuts in taxes on the wealthy. Finally, even as he has joined all of the other major presidential candidates in calling for repealing Obamacare, Trump has repeatedly promised to replace it with something “amazing” that would preserve many of its benefits and occasionally hinted that he agreed with the Affordable Care Act’s individual mandate — a position that he subsequently walked back. The results in Table 2 show that Trump’s rather eclectic economic views have helped him to attract the support of Republican voters with liberal positions on economic issues. We constructed an economic liberalism scale based on questions asking about cutting spending on Social Security and Medicare to reduce the deficit, raising taxes on households with incomes above $250,000, and raising the national minimum wage. Republican voters were actually quite divided on these issues with a large proportion taking the liberal side in opposition to the position of most Republican leaders. Fully 68% of Republican voters were opposed to cutting spending on Social Security and Medicare to reduce the deficit, 56% favored raising taxes on households with incomes above $250,000, and 39% favored raising the minimum wage. The results in Table 2 show that economic liberalism was related to whether respondents ranked Trump first among our 11 GOP candidates but not to whether they ranked him last. Fifty-one percent of those who scored high on economic liberalism ranked Trump first compared with only 23% of those who scored low on economic liberalism. The findings in Table 2 suggest reactions to Trump’s candidacy among Republican voters reflect his message — a combination of negative attitudes toward outgroups such as Muslims and immigrants and support for some liberal economic policies that benefit the middle class. In other words, Trump is running as a kind of populist. This can be seen more clearly in Table 3 which displays support for Trump in relation to economic liberalism and nativism. In order to measure the combined effects of economic liberalism and nativism, we divided each scale in half with roughly equal proportions of Republican voters scoring high and low. 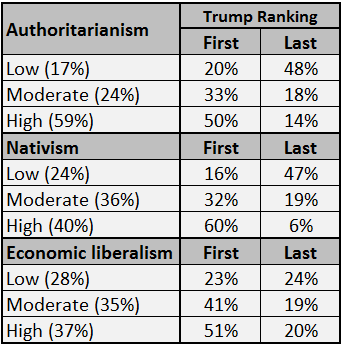 The results in Table 3 show very clearly that Trump does best among Republicans who score high on both economic liberalism and nativism while he does worst among Republicans who score low on both economic liberalism and nativism. About two-thirds of Republican voters scoring high on both economic liberalism and nativism supported Trump while only about one-sixth of those scoring low on both economic liberalism and nativism supported Trump. If we combine authoritarianism with nativism and economic liberalism we get an even stronger prediction of Trump support. 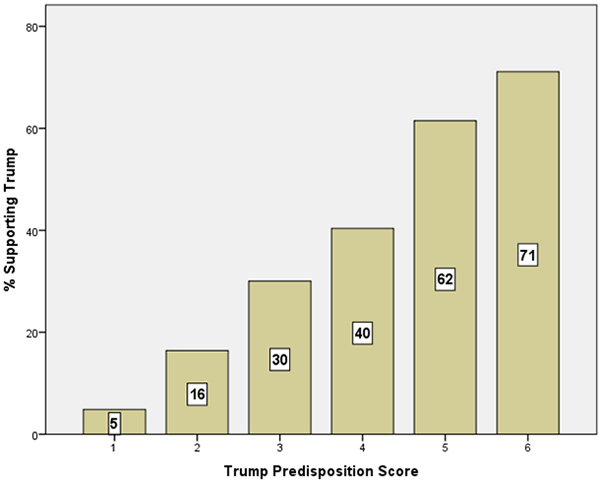 Figure 1 displays the relationship between Trump support and an index of Trump predispositions that combines nativism, economic liberalism, and authoritarianism. The results here show that the combination of these three predictors provides a powerful explanation of support for Donald Trump among Republican voters. The percentage of Republican voters choosing Trump as their first choice ranges from only 5% among those at the low end of the scale to 71% among those at the high end of the scale. Our results help to explain why Trump loves “the poorly educated.” They provide support for the conclusion that Trump receives support disproportionately, though by no means exclusively, from Republicans with less schooling and lower incomes. The results for education are especially striking — in our sample, Trump was supported by 46% of those who did not graduate from college versus only 30% of those who graduated from college. In terms of family income, he was supported by 44% of those with family incomes of less than $50,000, an identical 44% of those with family incomes of between $50,000 and $100,000 but only 30% of those with family incomes of greater than $100,000. Our data help to explain why Trump does best among those with lower incomes and less formal schooling. The results displayed in Table 4 show that these characteristics are associated with all three predictors of Trump support: Better educated and more affluent Republicans tend to score lower on nativism, economic liberalism, and authoritarianism. Once we control for these attitudinal predispositions, there is little relationship between Trump support and either education or family income. Less educated and lower income Republicans disproportionately support Trump because they score higher on nativism, economic liberalism, and authoritarianism. Our findings help to explain why Republican leaders have been struggling to find a way to block Trump’s nomination. They also help to explain why they have, so far, had little success in this effort. Trump is a uniquely divisive candidate within the Republican Party. He receives both intense support and intense opposition from Republican voters. As a result, his nomination would likely present a severe challenge to party unity. Our findings indicate that Trump’s strong performance in national polls and in Republican primaries to date reflects the fact that a large proportion of Republican voters agree with his message and approve of his authoritarian style of leadership. The strongest part of that message is clearly hostility toward outgroups including Mexican immigrants and Muslims, and the large majority of Republican voters agree with Trump on these issues. Trump’s supporters are also not traditional small government, low tax conservatives. He appeals strongly to a large group of Republican voters with relatively liberal views on certain economic issue — views that are clearly out of step with the positions of most Republican Party leaders and elected officials. For all of these reasons a Trump candidacy would almost certainly produce serious divisions among GOP leaders and voters, potentially leading to the election of a Democratic president and major Republican losses in down-ballot contests, including key U.S. Senate races. Alan Abramowitz is the Alben W. Barkley professor of political science at Emory University and a Crystal Ball senior columnist. His most recent book is The Polarized Public: Why American Government is so Dysfunctional. Ronald Rapoport is the John Marshall professor of government at the College of William and Mary. Walter Stone is a professor of political science at the University of California, Davis. Rapoport and Stone are the authors of Three’s a Crowd: The Dynamic of Third Parties, Ross Perot, and Republican Resurgence.